The story of the Crystal Palace road-race meetings, or path-race meetings as they were sometimes perhaps more accurately described, where GUS KUHN made an illustrious name for himself, really started in January, 1927, when the Club, London Motor Sports Ltd., realised that the magnificent grounds of the Crystal Palace in South-East London offered an excellent natural course for Path Racing. Accordingly, several riders were invited to attend one Sunday morning to try out a proposed circuit of one mile. The experiment obviously showed that the scheme presented unlimited scope for development, and the riders themselves were all agreed that it had provided excellent sport. Thus it was decided to go ahead with the idea. But there were many obstacles to be overcome. The Crystal Palace authorities adopted a pessimistic view and were rather sceptical that the idea could meet with any success. Nevertheless, after a hard fight, permission was obtained to hold a race meeting on May 21. These were, of course, anxious days for the organisers, for on the success of that first-ever meeting depended the whole future of the scheme. Meanwhile there was much to be done in the way of improvements to the course and of organisation for the first event. Although I have briefly described those three meetings that were held in 1927 in the last two pages, there is a little more to add. Regarding the initial meeting which included seven solo and three sidecar events it was reported that in one particular race, Gus Kuhn's cigarette blew out and that he did not bother to relight it until the end of the race! From start to finish every race was crammed with excitement and amusing incidents, and at the end of the afternoon everyone wanted to know when the next meeting would be held - road racing in London had become an established fact. The number of non-motorists who figured in the crowd of spectators was most gratifying. Incidentally, the admission price amounts to the princely sum of 1s 2d (6p) of which 2d was for entertainment tax. Programmes (20 pages!) were threepence or one-and-a-half pence in today's money. The lure of the spectacular was certainly an obvious factor, for the organisers of the C P meetings were exceedingly fortunate in having a miniature "TT" circuit, which, besides providing all the conditions to promote spectacular riding, was also so arranged that many thousands of people could watch from the amphitheatre the progress of the riders almost from start to finish of the difficult one-mile circuit. Enthusiasm was immense. Those were the days, of course, when highly-tuned roadster motorcycles took part, the machines being ridden on the road by their respective riders from and to home. Nevertheless it was a magnificent motorcycling era. And by this time next year (1928) Crystal Palace Speedway had become an illustrious Dirt-Track circuit. It was destined to open on Saturday afternoon May 19, amid a downpour of rain. On December 10, (1927) the renowned London-Gloucester-London Trial took place and again the entry for the annual classic event organised by the North-West London Club was a record - a total of 260, 232 being in the motorcycle category. A crisp, fine winter day; a record entry and exceptionally good organisation made the notable event one of the most enjoyable and interesting of the year's classics. But for Gus Kuhn on this occasion it was a failure. He was driving the Calthorpe, 498cc combination - with presumably a friend in the passenger's seat - and after covering Quarry Hill, near Marlow, some ten miles from the start at Slough, Maidens Grove proved a major hazard; which had never been in a worse condition. Normally strong men in the crowd of spectators shuddered at the sight of the slippery surface, and settled down to enjoy the spectacle of the competitors slipping, sliding, howling, scowling, laughing, and, occasionally, climbing. There were very few "feet-up" climbs and Gus was one of the unfortunate. But he and his passenger courageously plodded on - enjoying as he always did a National Open Trial. A combination such as Gus's demanded more concentration, more riding skill and more stamina that that of a solo machine. After the treacherous Maidens Grove Hill near Henley with its gullied surface and adverse camber, the route went through Nettlebed, Abingdon, Whitney and Northleach. Now came Winchcombe and the "Colmore" country was reached. Then came three observed sections in quick succession; Bushcombe, Gambles Lane and Mill Lane. Of recent years Bushcombe had been improved beyond all recognition. Once it was a freak hill on which the cream of the motorcycle world admitted defeat, but now it was, as one spectator remarked, disgustedly, a "main road," except that the gullies had been filled in with big stones. But the gradient was still one in five and quite slippery. After much bouncing, Gus Kuhn stalled with a burnt-out clutch much to his disappointment and this was the cause of his official retirement. Although his day's riding had come to an abrupt end there was always the next trial to look forward to and the Christmas Trial was only just around the corner. cares nothing for wet feet. 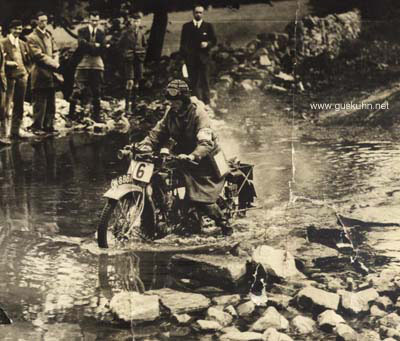 A snapshot at the watersplash near Leek during the International Six Day Trial. Maidens Grove was in a worse condition than ever before, and, although a few competitors made clean ascents, not more than a dozen of the solo riders succeeded in surmounting the hill with their feet on the rests. This was by far the most difficult hill in the trial and without doubt the Rudge-Whitworth entry was the most outstanding. Fay Taylour, Jack Amott and Peter Blamire being among the few solo riders to make perfect, feet-up ascents. Miss Taylour made the overall Best Performance by a Lady and was given a special award. She rode a works 499 Rudge-Whitworth - not a particularly light machine for trials riding. Two years later she would be known as "The Queen of the Cinders". In this particular Trial it was quite amazing the number of girl competitors, and some were award winners such as Miss B Slade who drove a 588cc Norton combination and won a Silver Cup. What courage! Miss I Cowley on a P&M (246cc) won a Bronze Medal; Miss B Lermitte (346 Royal Enfield) won a Silver Cup; Miss E Sturt (498 Scott) a Silver Spoon; Miss J Hole (346 New Imperial) who later became a Dirt Track rider won a Bronze Medal: Mrs P Shillabeer (495 Matchless sidecar) a Silver Spoon; Mrs T G Meeten (172 Francis-Barnett) a Bronze Medal; Miss B Painter (246 Excelsior) a Certificate; Miss M Newton (348 Douglas) a Bronze Medal; Miss K Kerridge (174 BSA) a Bronze Medal; Miss M Sorby (770cc BSA sidecar!) a Silver Cup; and Miss C Herbert (497 Ariel) a Bronze Medal. It is certainly very interesting to note that every girl competitor won an award when in the men's category 31 failed to complete the course. And look what heavy and massive machines some of the girls rode, especially Miss Sorby on a big 770cc BSA. Magnificent can be the only superlative. During my systematical and comprehensive research into these great days of motorcycle sport I have learnt many things and my survey has revealed a surprisingly large number of riders who would eventually become star Dirt-Track riders, promoters or to be closely associated with Speedway in some other way. And this London-Gloucester-London trial highlights the fact. Like Gus Kuhn, Triss Sharp (346 Wardill) also retired. He would soon be in the Crystal Palace Speedway Team. Arthur Warwick (490 Montgomery sidecar) was another who failed to finish the course; he went on to become a Stamford Bridge Dirt Track star, solo and sidecar! Len Parker (596 Douglas) won a Silver Cup; he was to make a name for himself particularly at Bristol Speedway and for several seasons he was a formidable member of the Wimbledon Team. Ed Farley on a 349 BSA won a Silver Cup and Ed became a notable King's Oak rider. Then there was Colin Watson riding a 497 Ariel who gained a certificate; he was initially to captain the White City Speedway Team in their impressive colours of red, white and yellow. Later he became the Wembley Lions skipper. Eric Spencer on a 348 Douglas gained a Silver Cup; in 1929 on DT Douglases he was a top Dirt-Track star gaining numerous successes. Jack Hill-Bailey was the man who from and including 1928 headed the Ilford Club for many years in the role of Racing Secretary at the Forest circuit at King's Oak near Loughton. It was Jack who was responsible for the first-ever King's Oak meeting on February 19, 1928. In the trial he was driving the biggest machine, a massive 989cc Harley-Davidson, with his wife Kay as passenger. They won a Silver Spoon. Sadly Jack died in the early 'fifties, but Kay is still alive [in 1977]. Now nearing 90 she is in a nursing home and I had the pleasure of seeing her a few weeks ago. One of the greatest Speedway stars-to-be was Jack Parker. He rode a 349 BSA and won a Silver Cup. Jack Martin (497 Ariel) won a Silver Spoon. It was Martin who early in '28 was unconscious for 22 days following a crash at Stamford Bridge. Very near to death on this occasion Jack was forced to retire from racing; he was associated with Calthorpe and other manufacturers, and he had a motorcycle business in SE London in Camberwell New Road. Del Forster (247 Levis) won a Silver Spoon. Remember Del on that beautiful works DT Rudge in '28? He was in the White City Team the season after. Gus Kuhn's next competitive event was to be the Christmas Trial, or in other words, the London to Exeter Trial organised by the Motor Cycling Club, and he was found busily preparing his machine. That burnt-out clutch in the London to Gloucester was still a "thorn-in-the-flesh" for Gus and the trusty Calthorpe was being doubly checked over. Instead of starting and finishing at Staines, as in previous years, the Trial would begin and end at Slough. First competitor would leave at 8 am on December 27th. The entry list was really fantastic. A total of 377! 136 solos. 93 sidecars. 17 and 131 three-wheelers and cars respectively. George Wallis was a new addition; he would ride a 498 Gillet. And George in less than a year would design the famous Wallis-JAP Dirt Track machine. He went into business with Teddy Comerford and with such redoubtable riders as Wal Phillips and Billy Lamont using the Comerford-Wallis machine it wasn't long before the bike had taken almost every track record in the country.